Blend chopped cookies, cocoa powder, milk and brown sugar in blender until smooth. Pour into 2-quart saucepan. Warm over medium heat. Add vanilla extract. Stir frequently, until hot and thickened. 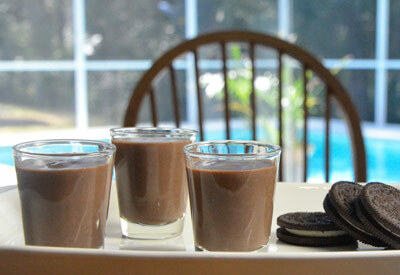 Pour into 8 (2 ounce) shot glasses; serve immediately.